Sports etiquette is a loose term. It really depends on the sport. Golf is more or less defined by etiquette while soccer is virtually devoid of it, save for a few forced token traditions. Tennis has for the most part maintained a sense of good etiquette and sportsmanship with each generation either straying from the path or returning to it. It’s interesting how some aspects of tennis etiquette ebb and flow. Whether you despise your opponent or not, you shake hands. 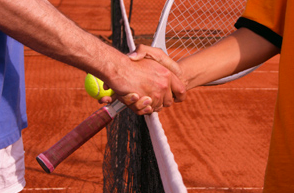 If you’re not up for the Homie Handshake, then at least go traditional and quickly get off court. However, there are times when the tension on court is so great that ego gets in the way. That’s what happened between Tomas Berdych and Nicolas Almagro. This is one of the ultimate F-Us to an opponent. Going for the head could get you banned from your club or tour. The body tends to be the safest option with the low blow option cowardly. Leave it to Ivan Lendl though, to take a crack at an opponent standing at the NET, in a MIXED DOUBLES match, in an EXHIBITION. Some trash talkers take it to a high art. Lendl, Connors and McEnroe led the way in that and while it’s less common these days, doubles tends to be the place where the art is still practiced. Leander Paes‘ name comes up a lot in this regard but he needs to be careful who he takes on. Personally I’d like to see him trash talk Mikhail Youzhny and see what happens. This is a more subtle tactic that typically, the crowd and media are slow to catch. It can take a few replays to check what happened. A full on shoulder check is rare or unless you’re playing Daniel Koellerer, a full on choke is required. Nadal took this bump pretty badly but did he trump it up to throw Lukas Rosol off? 6. Kicking a Line Judge! This should probably be at number 1 but on account of it’s absurdity, it remains at 6. I can’t remember anyone else doing this apart from David Nalbandian, much less at Queen’s Club, but there’s a first for everything. David enjoys soccer in his spare time, which probably did not help the poor gentlemen doing his job. This has crept into the game more and more unfortunately and none more so than with Rafael Nadal and Novak Djokovic, which is a shame since watching them play each other should be a joy and not a chore. Nole has curbed his OCD about ball bouncing but still uses the full 25 seconds. Nadal stretches this time even more liberally. This is one of the main tools in the Gamesmanship toolkit these days. Whether it is to keep on court trainers gainfully employed or not, it can disrupt the momentum of a match. Andy Murray is guilty of playing this card at times and to be honest, if the injuries were bad, no amount of magic spray would heal it. This used to be a women-only epidemic but the almost carnal noises that come from players, particularly clay courters is irritating to spectators and distracting to an opponent’s rhythm. My least favorite player right now is Marcel Granollers for this reasons. OK, so this is just a bit of fun, but it really does look like Rafa’s bored with the questions and taking a nap. In reality, he was cramping and the poor etiquette is in the fact that NO ONE got up to help him! What if he was having a heart attack or aneurysm? No one would know. Journalists!